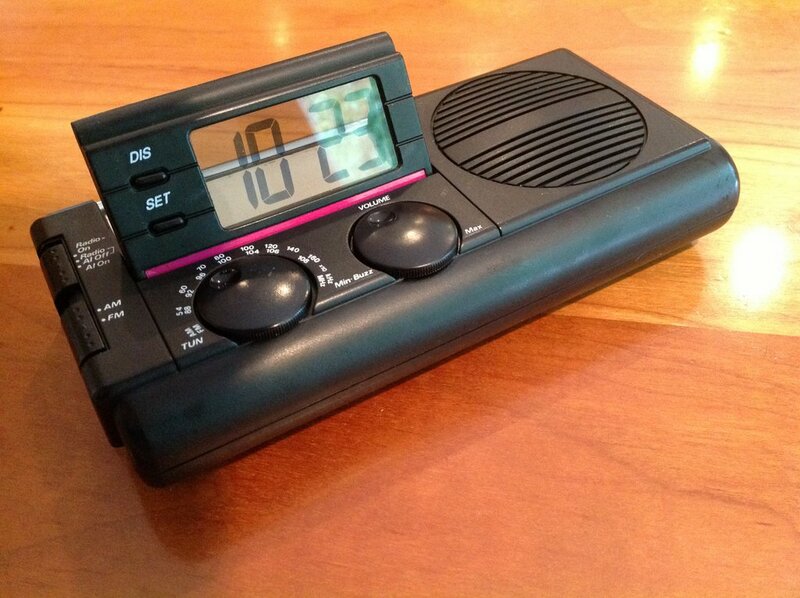 This is a basic AM/FM radio with clock and alarm functions. It runs off three AA batteries (for the radio) or a 1.5 V small cell battery (for the clock). There is also the option of powering it with an AC adapter (4.5 V DC, center positive). The speaker is 8 ohm, 0.5 W. As Ulli pointed out the three AA batteries are a very tight fit. Besides radio and alarm, there is also a headphone jack. The SET and DIS buttons on the radio are for setting the clock and alarm. In absence of a manual it took a little time to figure out how to do this. The clock LCD tilts up as shown in the photos. Needless to say the viewing angles leave much to be desired. This radio is meant to be used laying on a table; it has a curved bottom and cannot stand up on its own. In terms of performance, it’s good for powerhouse AM and FM stations. DXing is very limited or next to impossible due to the stiff tuning knob (you need two fingers to move it around; the dimple is not helpful) and the short circular tuning range. It’s hard to tell whether the radio has below average built-in selectivity with the Sony CXA1191S chip, or are problems zeroing in on stations due to the poorly designed knob. In my unit the volume knob was scratchy; this was easily fixed with a little DeoxIt spray. 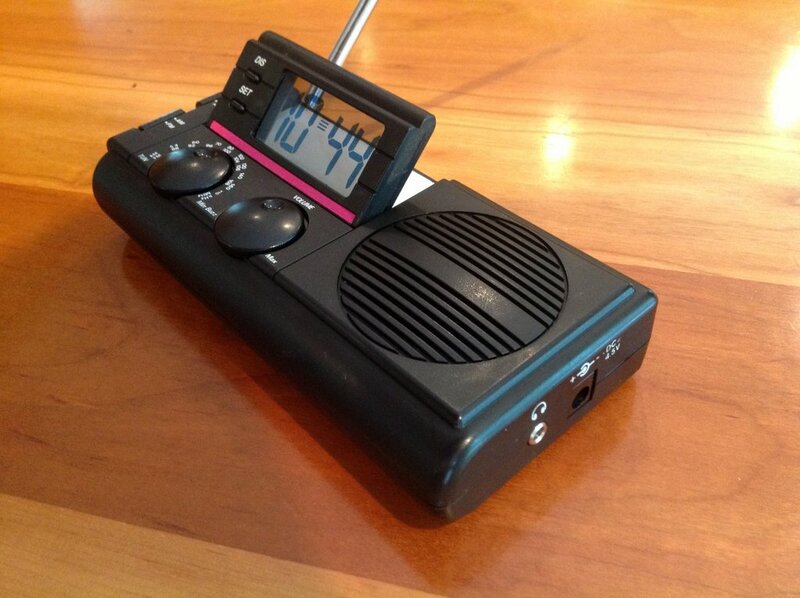 Among other curious things about this radio is its antenna, which goes out only at a fixed angle – not straight up. It can be moved from left to right at this angle and extended. 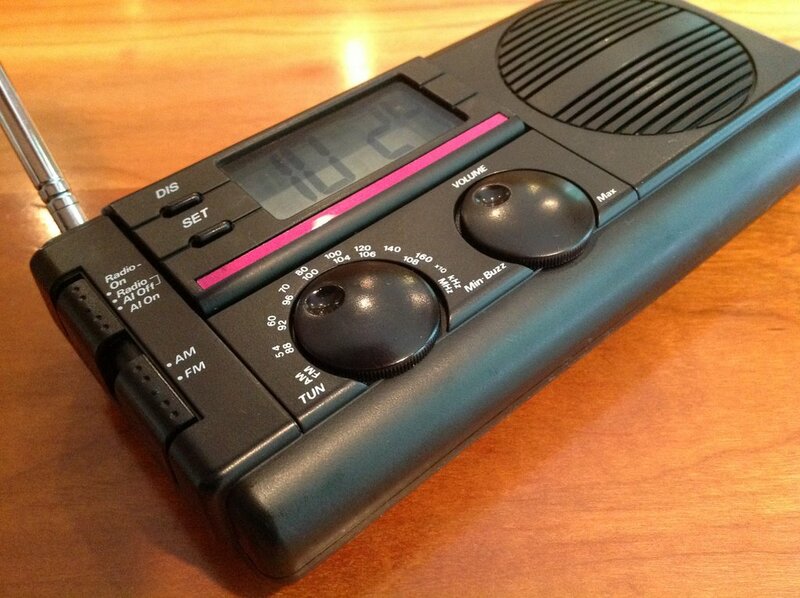 Overall this is a basic AM FM clock radio, measuring small (6.25 x 3 x 1.25 inches), and honestly, nothing really special! This entry was posted in Radios, Reviews and tagged AM, Mystery radio, Paul, Radios on August 3, 2013 by Thomas. It appears that Thomas has figured out how to set the time. Thomas, would you mind sharing that info? Actually, the only person who can help here is Paul (the fellow who discovered the radio). I’m not sure this particular radio was ever available in the US. Hopefully, Paul may be following the comments in this post.